Life changed significantly for me yesterday afternoon. At 2.57pm, I officially became a published author. Yeah, I know – how amazing is that?! After how many years? Too many, but I have never had any regrets over those years either. I have the feeling that I am walking on sunshine at the moment, and it hasn’t abated since I checked my email yesterday afternoon. I almost feel as though anything could happen now, and that there are beautiful, big, and bright writing horizons ahead of me. I’m sure that all writers feel like this when they finally get something published. It’s a pretty epic emotion. The fact that one of my stories is out there and published with some pretty incredible writers warms my heart even more. 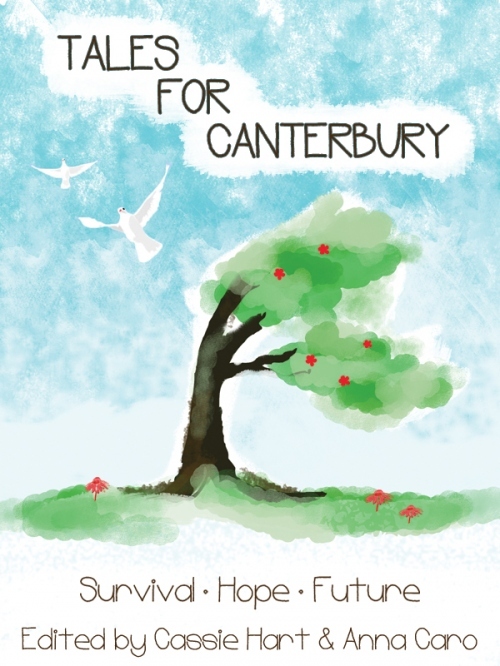 Last night I read a couple of the stories in the Tales for Canterbury anthology, and I was blown away by the talent that’s in this collection. What is even better is that 34 writers came together and donated their stories to this anthology to raise money for Red Cross Christchurch Earthquake Appeal. None of the writers are getting paid out of this… and all of the proceeds head directly to Red Cross for them to help those in need in this devastated city, which is going to take years to rebuild, and even longer to emotionally recover. Putting something like this collection together takes up massive amounts of time and love, and Cassie Hart and Anna Caro have completely dedicated themselves to the cause of getting this anthology compiled to raise money for the Christchurch Earthquake Appeal. Both Cassie and Anna have struggled with maintaining their own levels of writing while this anthology has been under way. It has been a huge commitment. In terms of pulling something together that is this big as quickly as they did is truly incredible. To them I raise my glass. They are amazing women. If you would like to know more about the incredible authors featured in it – please visit Tales for Canterbury. And what we would love even more is if you bought a copy over at Random Static Publishing. Congratulations, Leigh!! You’ve earned it! You are totally welcome Anna. Thank you for all your hard work, effort, and for being an awesome editor. Drink a bottle. Actually no… let the bottle me on me when we finally catch up in person.